Story by Craig Morrison, local Lighthouse Owner. We got on the General Service Administration list to be notified of any available lighthouses being excessed by the USCG under the Lighthouse act of 2000. We received many NOAs (notice of availability) in emails. We responded to several by submitting a letter of interest, after which time the GSA would call and schedule us to visit the properties with the help of the USCG. We visited Goose Rocks, Petit Manan Lighthouse and several others. We applied for Goose Rocks Lighthouse and were turned down. All hope was not lost. Several years later and many NOAs later we received notice for Execution Rocks Lighthouse, NY in the Long Island Sound. We submitted a letter, visited the site, applied and were accepted by the National Park Service, after several revisions to our application. I was amazed and still am to this day. Linell and I were the only group that applied to Execution Rocks Lighthouse, on the gold coast of Long Island, surrounded by several prestigious marinas and yacht clubs! I lived on Saba Rock in the BVIs next to Necker island in 1992 and saw visions of recreating this small island oasis in NY! We got the deed in April, 2009, put it in our 501c3, Historically Significant Structures Inc., with New York and Pennsylvania state and federal nonprofit status and applied for a grant in 2010. The New York Office of Parks, Recreation and Historic Preservation approved our grant. Let me be very clear at this point, this is a reimbursement grant, which means we have to get bids for the jobs using NY state criteria including MWBE, get the work approved to be done by NYSHPO in Albany, do the work, pay for the work, get that approved, and then get reimbursed. We have yet to raise enough money in our tower climbs and fundraisers to fix the roof and re-point and paint the tower exterior, but the grant office was kind enough to let us have an advance payment to get the lead paint out and redo the walls, ceilings with new paint. This was just completed. They also paid for our architect's specifications and appraisals. Our grant will reimburse us until the end of 2014 if you truly would like to help the restoration of this historic lighthouse. We are still waiting for the mason to complete the repair of the sets up to the island from the water that were built around 1850. Our island was manmade in the 1840s with granite from around 45th street in Manhattan. The tower was built by Alexander Parris in 1849, the same year Edger Allen Poe died. The keeper's quarter's, my new digs for next summer, was built by the lighthouse board in 1867, right after the end of the civil war. This brings me to the ghost stories, a result of the British executing colonists on the rocks beneath our island in the fall of 1775, as rumors have it. We are now offering the lightkeeper's experience to anyone with the desire to live on the island. We need to raise funds to finish the renovations, including a kitchen and bathroom. The portable caper's toilet is the best method, until we can afford an Incineret toilet and a generator. We offer thick air mattresses and a propane barbeques grill for the guest food service. We offer the 4th night free for the real lighthouse lovers. Transportation is provided by Matt Meyran of Port Washington Water Taxi, who has carried hundreds of visitors to our island in the past few years all summer long. Please visit our website for the 2013 tower climb schedule and the photos of the rooms. We have amazing before and after photos of the keeper's quarters. We are still hoping to find angels to help us recreate the steam engine room, as a day room and the shed, which will house another bathroom on the first floor. 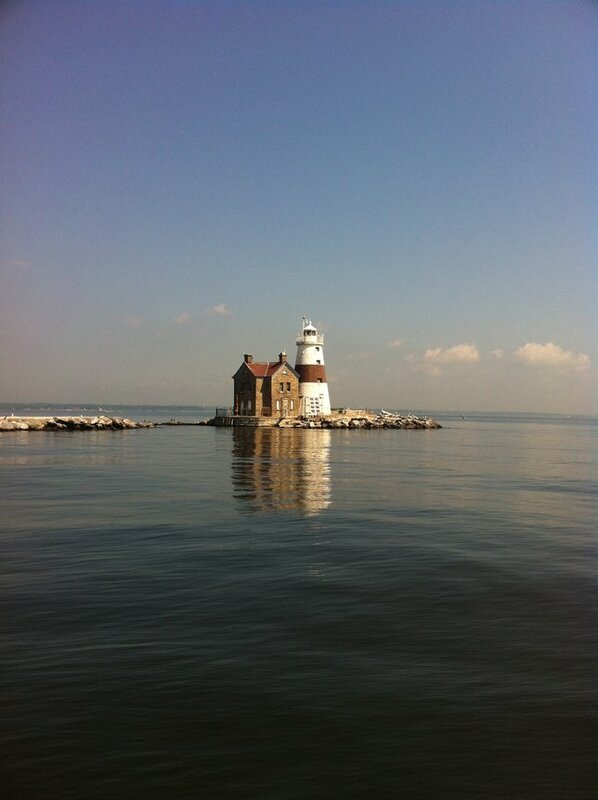 The waters surrounding the lighthouse are great for bluefish, bass, black fish and fluke fishing! You may bring your pole and rent a kayak to fish in! Clean up the fish and throw them on the grill. There's a beautiful view of New York City on the horizon to the west, about 20 miles away that lights up at night! The island is about 1400 feet offshore, even though the boat ride from Port Washington Town Dock is about 20 minutes long. We hope to see you at the lighthouse in 2013. Please call if you can help us make this light station a better place to visit for years to come! 2013 will be the first year that the keeper's dwellings will accommodate overnight guests not in the USCG or the lighthouse board ever! For more information or reservations, please contact Craig Morrison at 215-906-5103 or visit their website for more information. Festive Fun, Tree Lightings, The Holiday Light Show, News & More in November 30th's Newsletter! Subject: LongIsland.com - Your Name sent you Article details of "So I Wanted to Own a Lighthouse - The Diary of a Light Keeper"